A talk by an expert is often a good way of gaining new knowledge, such as information about recent research, very quickly. They are also usually good for meeting people. In fact, I think attending talks are so useful, potentially, that I'd even recommend going in your own time if you find out about one running in an evening or at the weekend. To help promote innovation, I think it's a good thing to attend talks outside your own specialist area. Learning about the challenges faced in other disciplines, and how they were solved, can be instrumental in the cross-fertilisation of ideas. However, you have to be strategic in deciding which talks to attend. There are plenty of opportunities to attend talks for little or no cost. At some conferences, for example, seminars are free to attend. That doesn't mean they are without cost. If nothing else, there is there opportunity cost: what you could be doing with your time instead. This could be attending a different seminar in a parallel conference strand, doing your own work, or even simply relaxing. Here are a few questions you might wish to consider. Is the topic relevant to you and your professional goals? It is not always possible to know the answer to this question in advance, of course. If in doubt, decide on the basis of whether it sounds interesting or not. What makes the speaker qualified to talk on the subject? The speaker’s biography on the conference programme should answer this question. Is the speaker trying to sell you something? There’s nothing wrong with that, but I always think that it is better if the seminar description makes it clear that that would be likely, because then you can make a more informed choice regarding whether to attend or not. Note that a “sponsored” session does not always mean that it will only be about the sponsor’s products. They may have sponsored the session as a means of brand awareness-raising rather than to have an opportunity to promote their wares. What is the speaker’s situation? For example, suppose the talk is about how the school uses Method X of teaching computer programming, and Method X sounds brilliant. It might be useful to know if the speaker has one day off timetable a week and a budget of thousands per annum. This is an aspect of “ecological validity” discussed in “8 Considerations to help you look beyond the hype”, a chapter in my book Education Conferences (see below). Would you learn anything genuinely useful by attending? I was going to write “new”, but actually even old stuff can be useful because it’s easy to forget things you used to know. And sometimes even mundane and obvious things need stating. What is the opportunity cost of attending the seminar? Even if attending the seminar would be fantastically beneficial, what is the cost in terms of the next best thing you could have been doing instead, for example meeting with somebody, attending a different seminar, or taking time out for a cup of coffee while you gather your thoughts and reflect on what you've seen and heard so far? 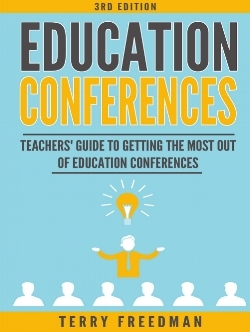 This article has been adapted from a chapter in my book: Education Conferences: Teachers' Guide to Getting the Most out of Education Conferences. Click the link for further details, or sign up to Terry Freedman's Books Bulletin to be the first to know when the latest edition has been published.